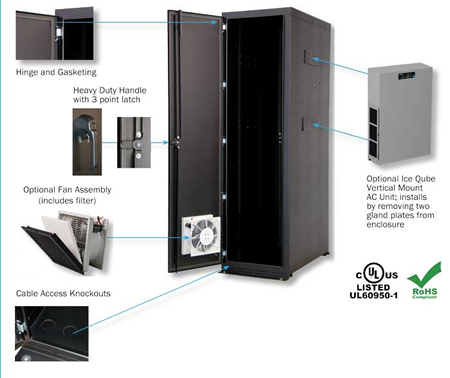 The Great Lakes GL840N12-3042-SS is a 45U NEMA Type 12 Server Rack Enclosure. Great Lakes' NEMA 12 Free Standing Enclosures are constructed to be compliant with the National Electrical Manufacturers Association's Type 12 standard. NEMA 12 enclosures are intended for indoor use to provide a degree of protection to the equipment inside the enclosure against dust, falling dirt, water and noncorrosive liquids. These enclosures are also intended to provide a degree of protection to personnel against access to hazardous parts which may be mounted within the enclosure. Doors / Fan Exhaust Front & rear door are set up with gasketed gland plates that can be replaced with a NEMA 12 fan with filter on the front door and a filter for airflow on the rear door. Doors will have a heavy duty three point latching system. Filters on fan and exhaust assembly are field replaceable. Sides / AC Mounting Enclosures will be set up with removable side panel options. Enclosure part number will indicate side panel configuration. "SS" will have two removable solid side panels. Side panels designed for accepting air conditioner units will have an internal baffle kit. This baffle kit will assist in directing hot and cold air from and to the a/c unit.